Are you a fan of The Walking Dead? Or like playing Plants vs Zombies on your phone? Why not make it into a reality and take advantage of your fall vacation to make your Halloween more exciting by joining a Zombie race or a Zombie run, and feel how it’s like being chased by the creepy zombies. Anyone can run, but it will change when you start running for your life from a horde of hungry zombies. 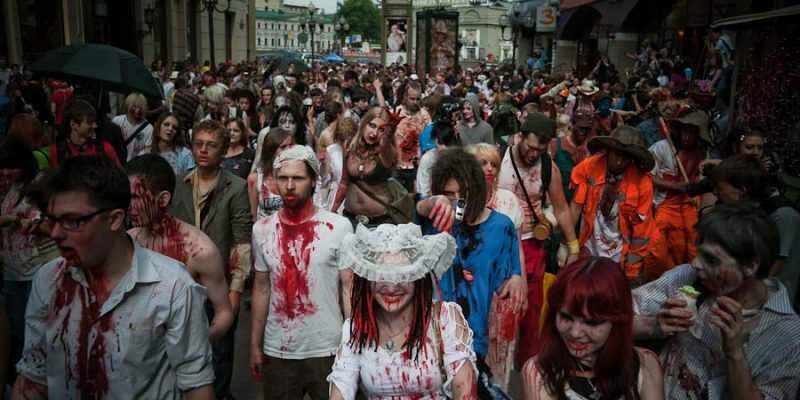 Here’s the best things you should know why you should join a zombie run and survive the zombie apocalypse. Halloween activities like the zombie run is one of the best way to mingle with your friends. Join as a group and run as a team. This can be fun if you reached the goal together. This is also a good chance to meet new friends and eat their brains! This is your time to show your makeup skills and dress like a real zombie. The scarier you look, the more effective it is to startle people running in the race. If you don’t know what to put on your face, here are some creepy Halloween makeup ideas you can try. Bring your best zombie costume and get muddy and bloody all over your body. Of course, the food will not be out of the list. After that long walk or run, what’s waiting at the finish line are barbecue and beer – a perfect combination for your hungry tummy. It also depends on the organizers what kind of food they’re going to serve. But barbecue and beer are the common food to go. It’s Good For The Health! You heard it right! We all know that running is good for the health, but how much more if we are running because of zombies chasing after us? If you are worried about how to get fit this fall, then this activity is good for you and at the same time enjoy while you are running. Get involved and try some other fall fitness tips. Best way to end a tiring yet fun activity is a party. This is also where the awarding of the “best zombie look” and other winners are awarded. Enjoy the live band or cocktail drinks and take pictures of the event and post it on your Instagram account. As the winter is about to come, it may become difficult on your part to stay motivated. So, trying different activities like this will help you keep a fresh spin on your usual routine and will allow for your confidence to build and enjoy your Halloween experience.